Net official development assistance continues to be disappointing. S-time-distance measure was used to get an easily understandable overview of the situation whether the 22 DAC countries are on- or off- the track to the UN 2015 target of 0.7 percent of gross national income to be devoted to official development assistance (ODA/GNI). In 2009 in the group with considerable delays USA, Germany, Austria and Canada were between 4-6 years behind the line to the UN 2015 target, the delay was about 7 years for New Zealand and Italy, and 8 years for Australia. The delay for Portugal, Greece and Japan was more than 9 years as the 2009 percentage was even below that in the starting year 2000. While several of the analysed countries are not officially committed to this UN target such common benchmark shows that there is a wide gap between the development assistance efforts among the observed 22 countries. The ODA/GNI value in the five European countries that have already reached the 0.7 percent target is in relative terms four times higher than in the group of four countries (United States, Japan, Italy and Greece) where it does not exceed 0.2 percent of their GNI. It is clear that if there is a will there is a way. Expressed in time units (years, months, etc.) the interpretation for monitoring with S-time-distance measure is easy and intuitively understandable to everyone. For given level of actual values it deals with the deviation (lead or lag in time) between the time when such actual value was attained and the time when that level was supposed to be reached on the line to the 2015 MDGs target. It is like tracking the actual arrivals in comparison with the train or bus timetable. Thus it represents an excellent presentation and communication tool that is intuitively understood by policy makers, experts, managers, media and the general public. 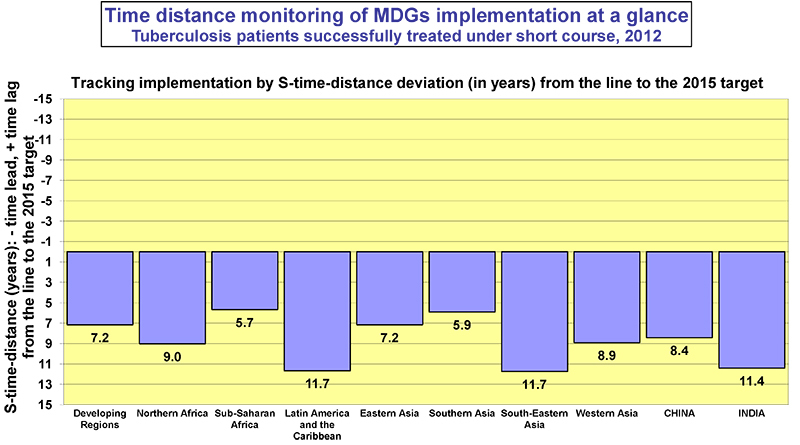 The results are prepared using the free web GAPTIMER monitoring tool for calculation and graphing of S-time-distance deviations from the line to target that allows numerous stakeholders to benefit from this novel statistical measure for policy debate for many issues and at various levels.